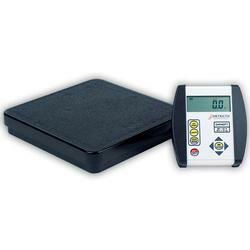 Accurate and reliable, Detectos economical DR400C platform medical scale is lightweight and portable, making it perfect for mobile clinics and home care nurses. the remote indicator features a large 1/25mm display, units conversion, and tare. The unit has a slip-resistant mat to ensure patient safety when getting on and off the scale. The DR400C is battery powered, so you can take it anywhere you need it. The new Detecto 750 weighing indicator is the perfect weight display for all applications. The recharging circuitry is “Built-In” to the 750 display. Utilizing the AC-adapter and installing Ni-Cad “AA” batteries, you can have a truly free standing scale in any office environment. Operate up to 250 hours on new alkaline batteries.